Investor sentiment was weak on Wednesday as Wall Street sifted through and awaited another batch of earnings reports, including by Apple and Facebook. Dow Chemical (DOW)reported a double-digit increase in net earnings earnings per share compared to the year-ago quarter. Procter & Gamble (PG), a producer of household consumer goods, also reported a gain in diluted net earnings per share. Aircraft maker Boeing (BA) is also due before the opening bell. Apple (AAPL), Facebook (FB) and Zynga (ZNGA) are reporting after the close, along with consumer-focused companies Crocs (CROX) and Cheesecake Factory (CAKE). U.S. stock futures were drifting lower. U.K.-based chip designer ARM Holdings (ARMH) -- part of the CNNMoney Tech30 Index -- reported record revenue and profit in the first quarter, but results were slightly weaker than analysts were expecting. Its shares fell in London and in premarket trading in New York. Shares of Yum! Brands (YUM) were rising before the bell after the company's earnings beat expectations. Gilead (GILD) Sciences shares rose in premarket trading after it blew past earnings estimates, while Amgen (AMGN) failed to live up to analysts' expectations. The biotech sector has taken a beating in recent weeks after experiencing a run up early in the year. In economic news, the Census Bureau will release new home sales numbers from March at 10 a.m. ET. 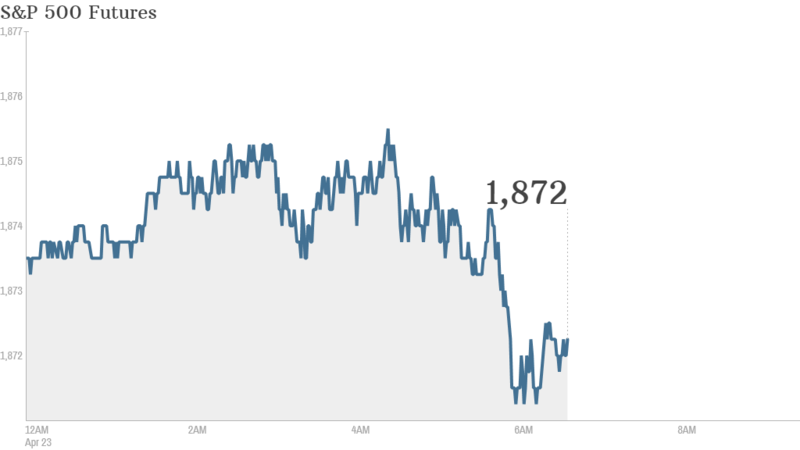 U.S. stocks rose Tuesday. It was the sixth Tuesday in a row that the Dow Jones Industrial Average ended the day with gains. The S&P 500 and Nasdaq also advanced. European markets were mostly slightly weaker in morning trading but the losses were modest. Asian markets closed with mixed results after the latest survey of manufacturing activity showed China's factories continued to struggle in April. But there was a silver lining in the PMI report, according to analysis from Capital Economics, which said "that while conditions in the manufacturing sector continue to weaken, they are no longer deteriorating as rapidly as before. It adds to growing evidence that, with infrastructure investment picking up, the recent slowdown in economic activity has begun to moderate." Both of the main stock markets in China were lower, while the benchmark Nikkei in Tokyo jumped by 1.1%.